The reality is we have MS. Now, we have two choices…. One, we can either think about what we can do or two, we can think about what we can no longer do. No matter what, this is our new reality. As difficult as our hardships maybe, it really is our choice how we choose to go on living. The first choice involves changes and adjustments to our new life, which will allow us to go on living and enjoying the life we have… smiling, even laughing. Yeah, it's not what any of us expected, but life throws us curves every day. Sometimes there as simple as locking our keys in the car, having the power go out or breaking a fingernail, so we adjust and continue our day. I know the problems resulting from MS are not as trivial as breaking a fingernail or sitting on your eyeglasses, which I have done several times, actually. How about joking about the situation. The situation may not be funny at the time, but when you look back a lot of times the trials and situations we find ourselves in can be hysterical. For example, I got stuck on the soapy shampoo covered floor of the shower. Trying to extricate and up right myself from that situation was like an episode of the DickVan Dyke show – "Oh, Rob! " Well, I am aging myself I know, but if you're too young to remember or have seen the show, with today's technology that's an issue easily rectified, or you can just visualize Bambi trying to stand up on a slippery ice covered pond. The second choice is a life of dispare, worry and loss. Either way, if you are a believer and are truly walking the walk and not just talking the talk as they say, you have eternal life in Christ. Remember, God has a plan for your life. MS does not present a stumbling, block for our Savior. Do you think that He is surprised by or taken back by the introduction of MS to our lives? Come on, our God, the great I Am, the Messiah, He who knows all that was, is and will be. He was the Victor and we are victorious in Christ Jesus. Remember, God is in control. For example, I remember back in the mid 1980s, keeping in mind that I was diagnosed with MS in 1980, I was out at a dance club one night and I asked a young woman who I had never met if she would like to dance. She kindly said yes. After dancing to a few songs the young woman, Liz, joined me at my table. My first statement went something like this… "I apologize for stumbling out on the dance floor. You see, I have MS". I was surprised when Liz began to laugh. I said, with a smile… oh, you find that amusing? Liz responded, no, I have MS too. Turns out, at that time we both had been living with the invisible symptoms of MS. Turned out that Liz and I ended up dating for several years. So when you hear people say, "God works in mysterious ways" know that it's true. Both Liz and I were living with 99.9% invisible MS and we thought those trials and tribulations were difficult. I remember people thinking I was drunk.… I was. No, I am just kidding. Looking back on those symptoms (dragging my right foot when I was tired, unsteadiness, numbness in my right hand. bladder urgency), I have to laugh at what I saw as hardship. Today I live with reduced sensation over 80% of my body, bladder issues worthy of an indwelling catheter,Yippy! , visual problems… lack of depth perception, nystagmus, blurriness, missing portions of my visual field and shaky vision. All of which makes driving a real life video game… I'm kidding. As someone who is legally blind, I had to stop driving in 1995. I'm also living with intention tremor, dizziness, cognitive issues made worse by heat and stress and the big one… I've been using a motorized wheelchair full-time since 2006. And, who knows what the future holds. Yet, through all of this I know that I am truly blessed. Again, who knows what the future holds. Trust in God And with Hope and Faith We Shall Persevere. God knew what we were before MS, He knows while we have MS and although I don't know what the future has in store for us, what I do know is that the Word of God says that He will not forsake us. 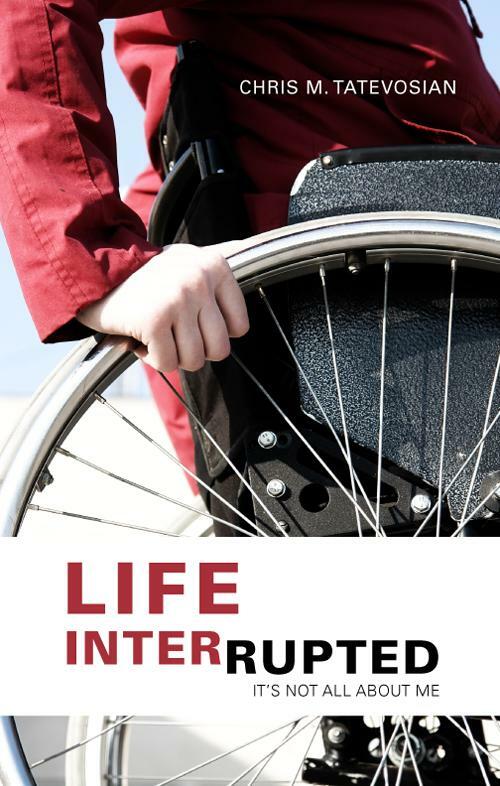 To find out more about MS, living with MS from a Christian perspective and Chris's book visit Life Interrupted. You can get your copy of Life Interrupted at Amazon and at other fine online bookstores everywhere. You can read what others are saying about Chris's book at his author's website testimonal page at Life Interrupted Testimonials.